The Clean Ganga mission was one of the flagship initiatives of the Modi government that has promised to achieve it by 2020. 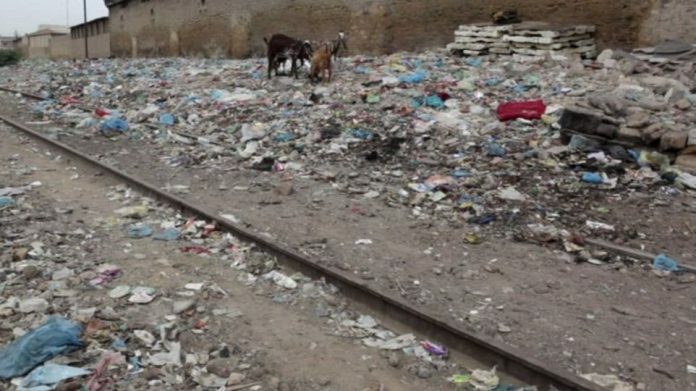 New Delhi: To discredit the BJP’s claims of cleaning up the Ganga, the RJD put up a picture on Twitter of a filthy railway track in Pakistan’s Karachi, to give the impression of a dirty Ganga ghat. दागदार मोदी को अधिक चुनाव प्रचार की ज़रूरत नहीं पड़ती है, गोदी मीडिया का मुँह काले धन से भर दो, चुनाव प्रचार हो जाता है! There were four pictures posted together. Moving clockwise in the picture, the image of people washing their clothes along the banks of the unnamed river is actually a Shutterstock picture from February 2015 or before. The second image could not be verified. The third picture is a photo from July 2015, and the fourth picture is that of a 2013 railway track in Karachi, Pakistan. The picture, which was also shared by RJD leader Tejashwi Yadav, went viral. The shared tweet has over 1,600 retweets and 7,000 likes. Yadav captioned the post, “When it comes to discussing issues, the spoon-fed media is unable to do it #DiscussIssuesNotModi”. The ‘Namami Gange’ initiative is a flagship project of the Narendra Modi government, which promises to clean the river by 2020. The project has, however, drawn flak for being ineffective, with opposition parties using it to target the BJP.